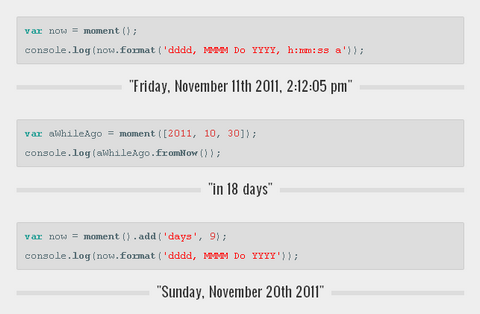 Instead of modifying the native Date.prototype, Moment.js creates a wrapper for the Dateobject. To get this wrapper object, simply call moment()with one of the supported input types. Moment.js is freely distributable under the terms of the MIT license. jQuery Timelinr is a simple plugin helps you to give more life to the boring timelines. It supports horizontal and vertical layouts, and you can specify parameters for most attributes: speed, transparency, auto-play and etc… You can also customize the style with CSS easily. Mobiscroll is a wheel scroller/Date and Time picker jQuery plugin for touch devices (Android phones, iPhone, iPad, Galaxy Tab). The control can easily be customized to support any custom values and can even be used as an intuitive alternative to the native select control (dropdown list). The control is themable. You can easily change the appearance of if in CSS. It also comes with pre-defined, nice looking color schemes. It has been tested on iOS4, Android 2.2, Android 2.3, Chrome, Safari, Firefox, IE9. glDatePicker is a simple, customizable, lightweight date picker calendar plugin for jQuery weighing in 4KB compressed (11KB uncompressed). It includes features like forward and backward navigation, current date highlight, restricting selection of dates, individual styles per date picker, and show currently selected date. 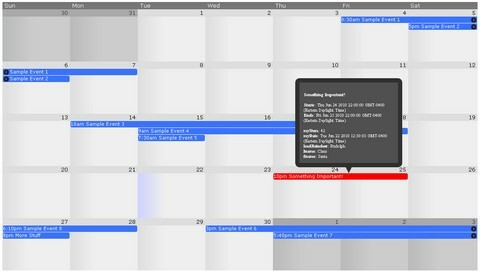 jQuery Frontier Calendar is a full month calendar jQuery plugin that looks like Google Calendar. All UI elements such as next-month & previous-month buttons, add event form, edit event form, tooltips, etc, are not part of the calendar plugin. These are to be created by you so you can control how they look. Use the API hooks in your form elements to control the calendar. When there are too many agenda items to fit within a day cell a “more” link appears. Clicking this link gives you a jquery modal dialog which displays all the agenda items that fall on that day. You may change the background image via the CSS file. wdCalendar is free (open source LGPL license), easy to use, and with great functionalities. You can check out the demo, and download it here. 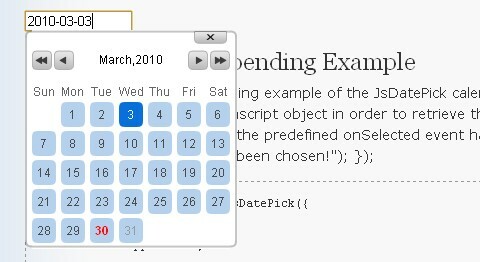 CalendarPicker is a free ultra-light calendar/date-picker jQuery plugin. It looks different from all the others, supports multiple languages, and allows fast movement across months and years. This approach might not suitable for every context, but I am sure someone will find it useful. CalendarPicker enables mouse wheel to change dates; it is enabled on years, months and days bars. 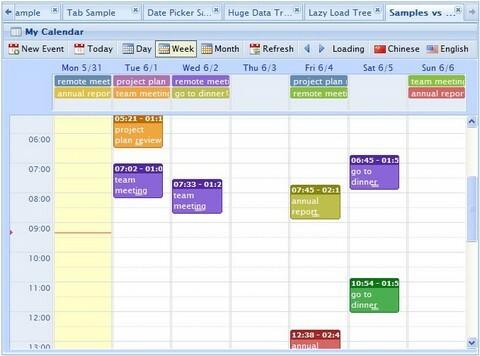 Calendar picker is released under MIT license. The user launches the calendar by entering the input field, and then chooses a date, automatically returning the selected date to the field. jsDatePick has a range of parameters for extending or limiting default functionality. However, this isn’t going to work in any currently available version of Internet Explorer or many older browsers. It only works in Google Chrome, Safari and Firefox 3.5+ browsers support the CSS transform property.